Sizes: 3 1/8" by 2" at the largest point (rose and leaves) and 1 1/2" at the ruffled wrist. Conditions: Excellent. There is a tiniest stress line on a leaf, the one between the rose and the rose blossom, not visible looking at brooch from the front and barely visible by naked eye even when you know where it is located. 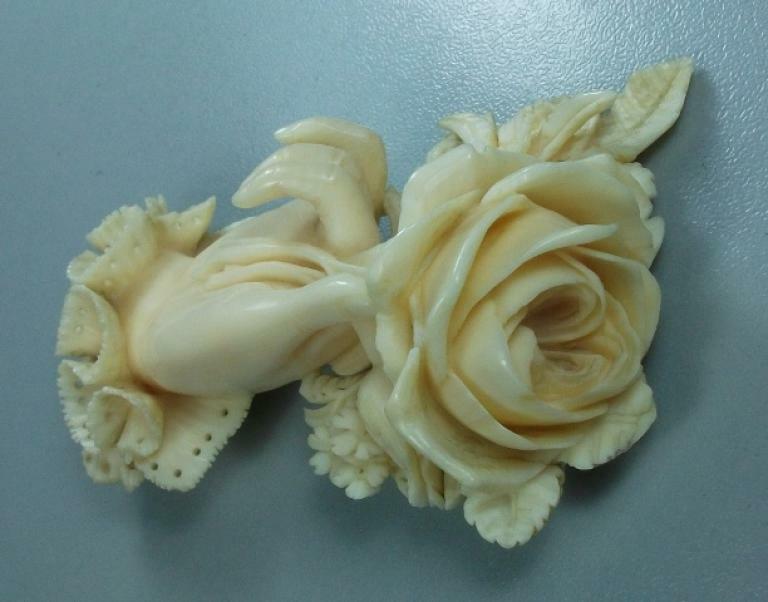 On the back, there is an added piece of ivory, perfectly worked to follow the edges of the brooch. 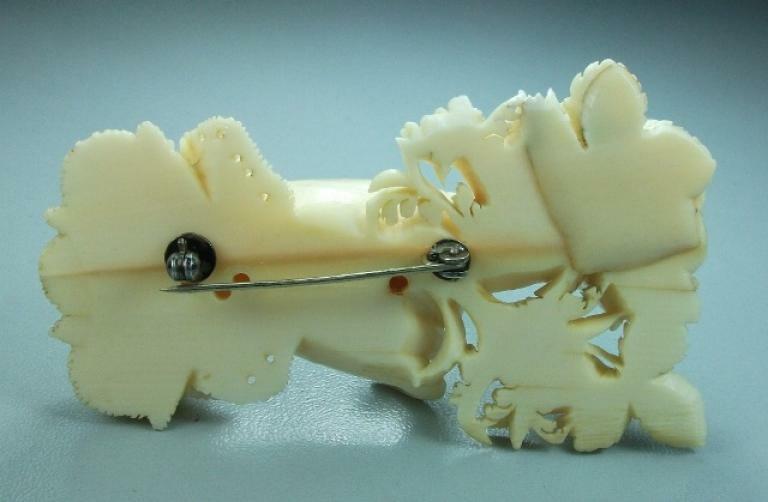 I think that it was applied there after that the small stress line was noted, to protect the incredible and delicate work of the brooch. 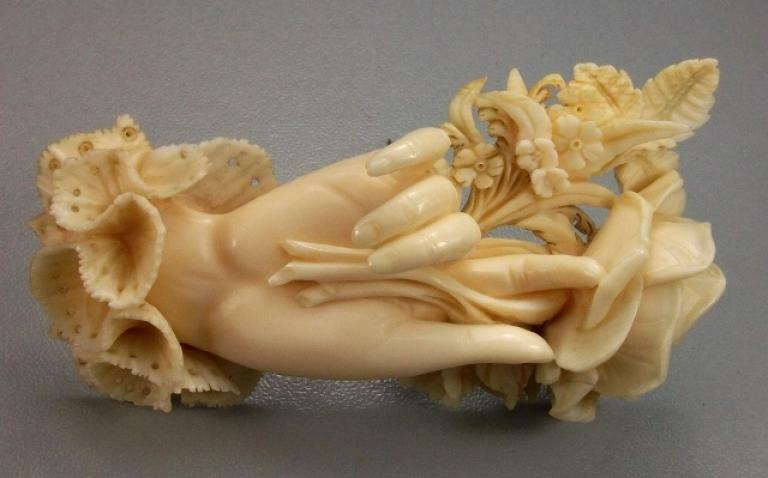 Date and origin: Circa 1850, Germany. 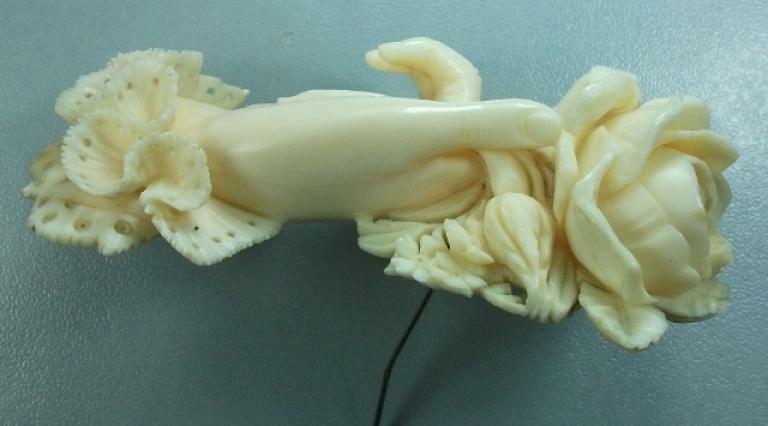 This brooch has been restored. It was sold some months ago along to a lava cameo to the same collector who loved the two pieces but because this brooch had a few flaws, more than normal given its age, I was asked to restore them both. 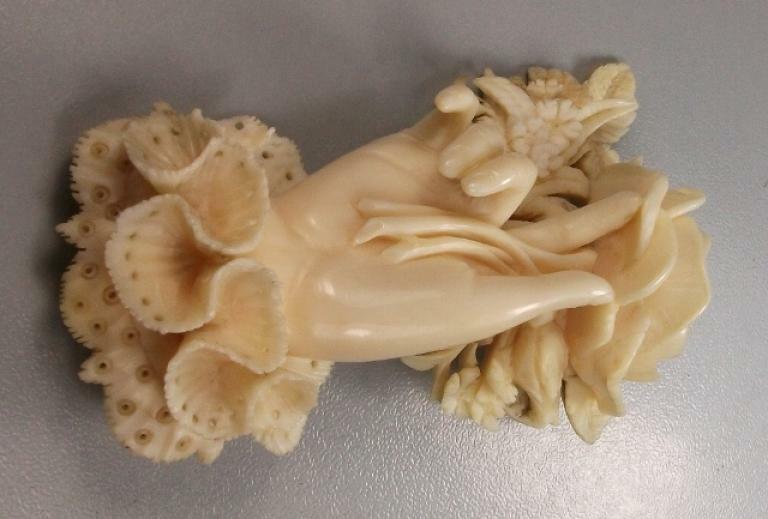 The ones who know me know very well that I'm never agree to restore antique cameos or other antique pieces, first because signs of time are a guarantee that any piece is just antique, then the antique cameos and jewels are delicate and working on them there is the concrete risk to damage them. However that collector wanted them restored, I was told that if I did not do it I had then lost the sale. I found the best restorer of antique jewellery, it was hard as the skilled ones are rare, and he did a lovely work with both pieces, the collector got this service for free. The collector was happy and started to pay them by installments. After the fifth installment I got an email where I was told that because of hard familiar problems he could no more purchasing the pieces. Of course I refunded what already paid but I also lost what I spent for the restoration. I'm listing them again but for fairness I'm advising you all about the restoration of these ones. Thanks for your attention. 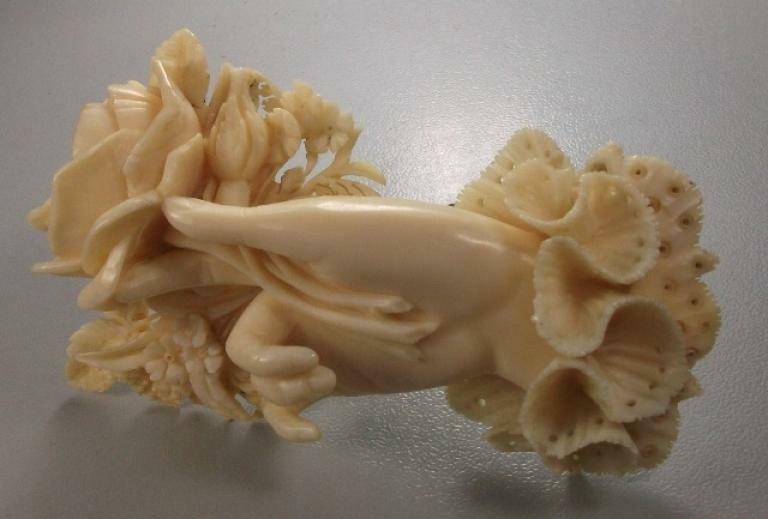 This is a more than Museum Quality carved ivory brooch. It is huge as you can see reading the sizes. 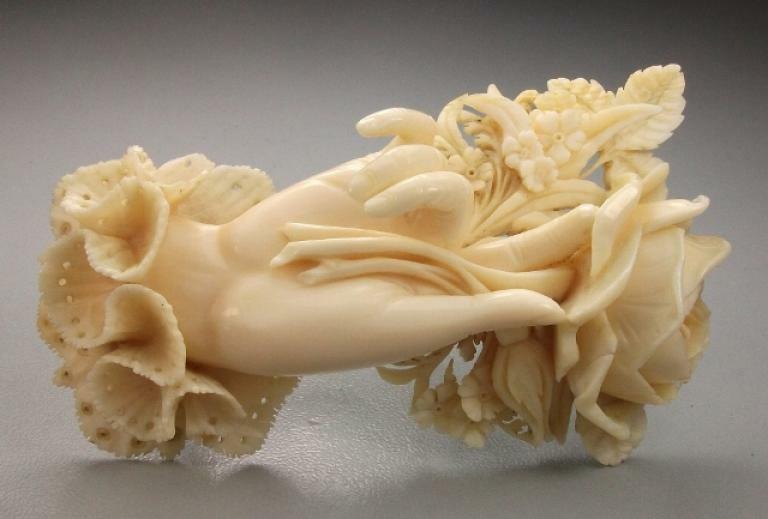 I really did not believe to my eyes when I saw it, one of the most beautiful ivory carving ever seen in all my life. 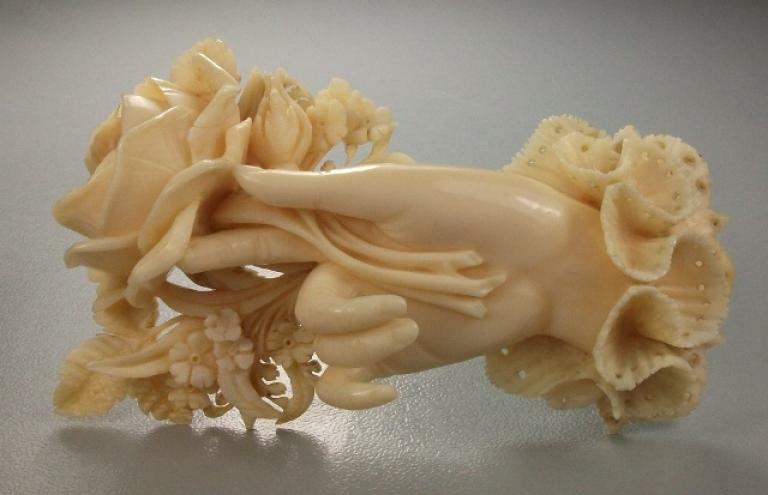 The abundance of details is amazing and the carving is something which leaves you speechless. 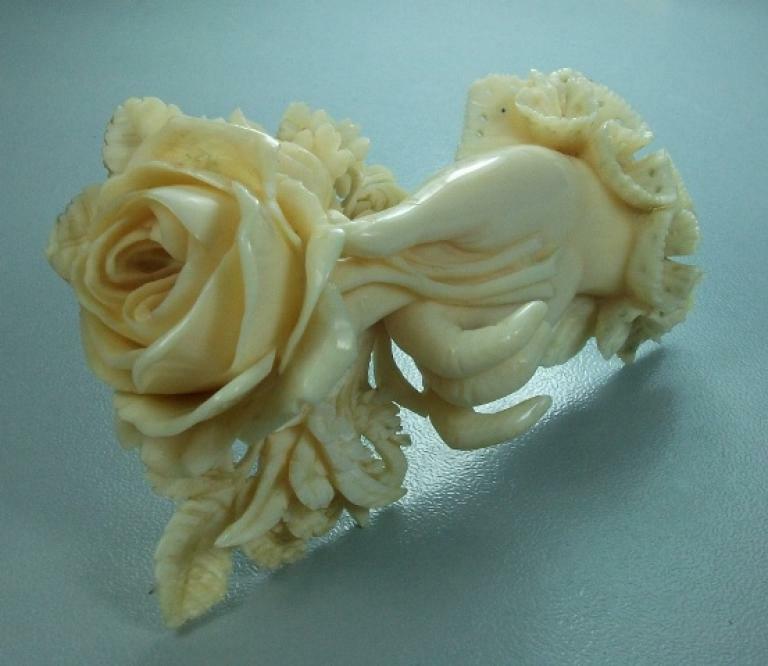 Look how the rose inside is carved, it is incredible. Look then at the lace ruffled wrist, simply incredible. Then look at the fingers, they are real. 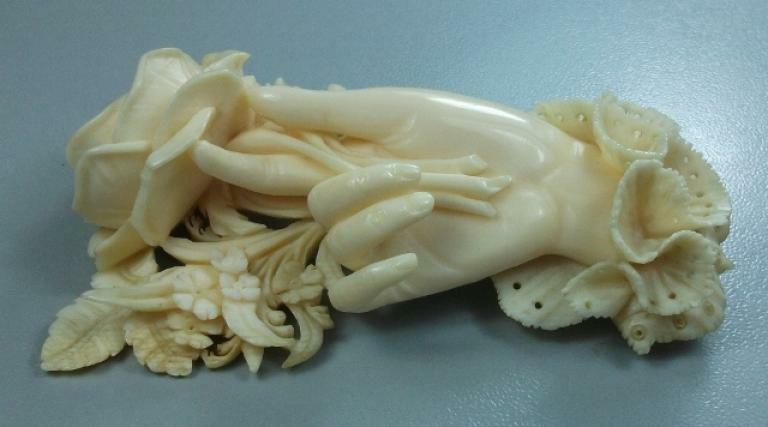 All the Victorian spirit is in this brooch. Roses and forget me not's were one of the symbols of the romantic Victorian era. This is a true amazing piece and, as I said above, finding a piece like this in this excellent conditions, is almost a miracle, I'm amazed that it survived almost intact since it was so delicate. 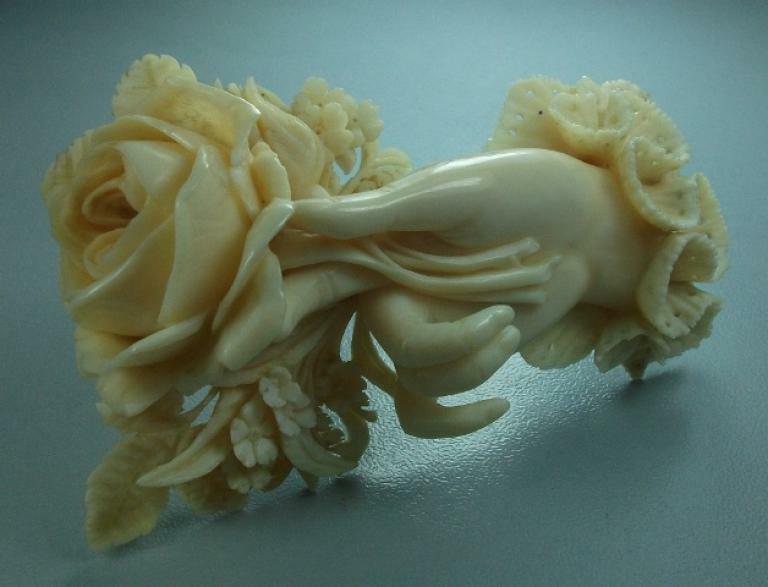 This kind of brooches were often used as gift on the Valentine Day or gift for a beloved one as they symbolized love a devotion. On Victorian postcards this subject was often painted. This is a real great find and a must have for any collector.